Learn about the temperament and personality of the Silky Terrier. Discover what he's like to live with, his traits and characteristics and how he generally behaves. And look at lots of Silky Terrier photos. The Silky Terrier wants to be your best buddy. He is a friendly, affectionate, scrappy little guy who does not like to be ignored. They do not do well if left alone for hours on end. They want to be with you! And this can be easy to do because they are very portable and adaptable. Silky Terriers have a high activity level and like to play fetch and go for daily walks. They do best with a fenced-in yard to tear around in. They are intelligent, but can be a bit stubborn and difficult to train. Housetraining can be especially challenging. They are alert and make extremely good watch dogs, as they usually only bark for a reason. They will raise the alarm whenever someone approaches your property. They can be dog aggressive and they have no idea how small they are. They do not do well in a home with young children because even though Silky Terriers think that they are tough, they are really quite fragile and could easily be hurt by a well-meaning toddler. In short, if you have lots of attention to give, the Silky Terrier will have lots of love to give you back! These are joyful, cuddly, little dogs. The Silky Terrier is intelligent and quite easy to train. He learns new commands quickly at an above average rate. 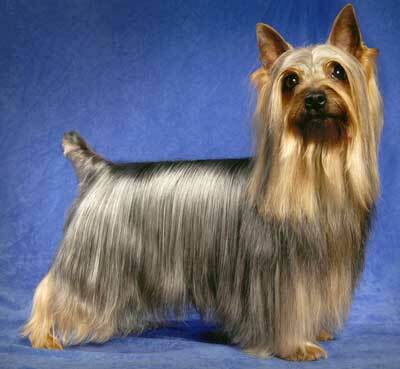 The Silky Terrier sheds practically no hair at all. You'll virtually never find a hair in your home!